When Tony and I bought our 80-year-old farm house eight years ago, the little strip yielded an extravagant crop. One year I picked asparagus until September. The thorny canes produced quarts of blackberries as big as my thumb. Now the relationship is in trouble. The berries have been AWOL for two years and the asparagus is beyond grumpy. It would be easy to blame a flood followed by back-to-back brutal winters, but I suspect irreconcilable differences. That would explain why the pitiful handful of asparagus I picked last week seemed so happy when introduced to a lemon. No offense, blackberries, but this marriage was meant to be. Yeah, you’ve had asparagus with lemon before, but you’ve never experienced the passionate connection these guys made in my kitchen. I fried lemon slices in butter with a pinch of sugar and paired them with asparagus spears in an upside-down appetizer tart. Think tarte tatin, but savory instead of sweet. I’m planting a new blackberry patch this year. Maybe I’ll toss in some rhubarb. Or is it too soon? Thaw pastry according to package directions. Slice lemon and cut and wash asparagus. Place an 8-inch oven-safe skillet over medium heat. When hot, add oil and butter. After butter melts, sprinkle sugar evenly in skillet. Arrange as many lemon slices as will fit in skillet in a single layer. Cook, turning once, until the edges begin to turn golden. Remove from skillet with tongs. Remove skillet from heat. 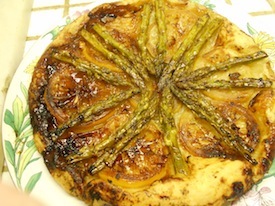 Arrange asparagus spears in a spoke pattern in the skillet, with the tips the center. Place lemon slices in a pattern on top of the asparagus. Unbend puff pastry sheet and roll briefly with a floured rolling pin to remove creases. Use a 9- or 10-inch round cake pan as a guide to cut pastry in a circle. Place pastry circle over asparagus and lemon slices in pan, tucking edges down along the insides. Bake at 375 degrees for about 25 minutes, until pastry is cooked through and starts to turn golden. Remove from oven and immediately invert onto a plate. Sprinkle with coarse sea salt. Serve warm or at room temperature. The Cleveland Asian Festival has become one of the fastest-growing summer fetes in Ohio, with good reason. It’s a heckuva food-lover’s paradise, with booths vending goodies from the Near and Far East and just about every country in between. Last year I saw Philippine, Korean, Cambodian, Thai, Japanese, Taiwanese, Laotian, Hmong and Bhutanese dishes, among others. The 6th annual festival will run from 11 a.m. to 7 p.m. this Saturday and Sunday (May 16 and 17) at Payne Avenue between E. 27th and E. 30th streets in Cleveland’s Chinatown. In addition to food, there will be entertainment on a couple of stages and dozens of booths dispensing information and Asian-centric products, including a few with cool Asian clothing. Admission and parking are free. More details are on the website, http://www.clevelandasianfestival.org/2015/ . The big organic plant sale at Crown Point Ecology Center in Bath is expanding into a festival this year. I’ll be doing my part by offering a free cooking class, Grilling from the Garden, at 10 a.m. Saturday (May 16). The area around the barn will be alive with food trucks and vendors selling pies, croissants, herbal teas, coffee, hand-made cheeses, baked goods and crafts. In addition to my cooking class, where will be a container garden workshop at 1 p.m. and a session on rain gardens, native plants and composting at 2:30 p.m.
On Sunday, chef Dan Remark will host a cooking demo at 1 p.m. The plant seedlings are the stars, though. The more than 230 varieties, from artichokes to ground cherries, include Slow Foods USA’s Arc of Taste heirloom breeds, native prairie seedlings, and a depth and breadth of herb varieties that is astounding. The plant sale and events run from 9 a.m. to 4 p.m. Saturday and 11 a.m. to 3 p.m. Sunday at 3220 Ira Road in Bath. For more information, see the website: http://www.crownpt.org . Do you have a cold couscous salad recipe? I found some at a local grocery store but cannot afford $7.99 a pound. I’d rather make my own. Thanks. 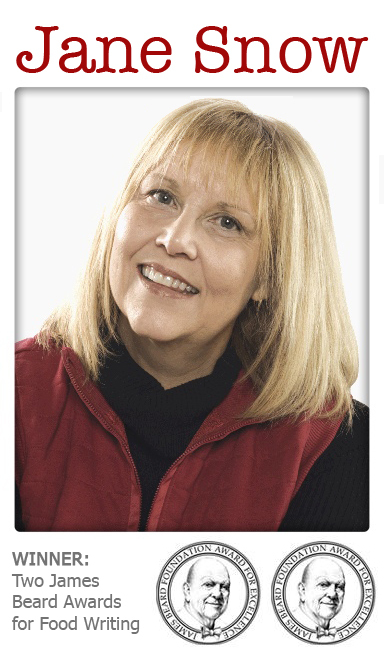 Dear Carol: I don’t remember where I got this recipe, but I liked it enough to share in a Beacon Journal article about pasta salads. Does anyone else have a recipe for a great couscous salad? For the salad, place water in a 2-quart, microwave-safe bowl and microwave on high power until water boils. Remove from oven, stir in couscous, cover and let stand 5 minutes. Meanwhile, place chopped carrot in a microwave-safe bowl. Add 2 tablespoons water, cover with plastic wrap and microwave on high power for about 1 minute, or until carrots are softened. Combine in a large serving bowl with yellow squash, zucchini, raisins and almonds. lumps are gone. Cool a few minutes longer, fluffing occasionally. Combine with vegetables. Add dressing and toss thoroughly. Makes six to eight servings. Hi Jane. My eldest is turning 17 next month, and cooks a little bit. She’s interested in being in the kitchen, and likes reading cookbooks. Do you have any recommendations for a good beginner book for her? I have “Joy of Cooking,” a Cooks Illustrated’s large tome, a Julia Child, a Jacques Pepin, “Bistro Cooking” by Patricia Wells, “Biba’s Italian Cooking,” “Yan Can Cook,” two by Alton Brown, and more. She enjoys food from many cultures. Dear Molly: You can’t do better than Julia Child for teaching techniques to beginners and veteran cooks alike. I’d go with a book that has photos, such as “The Way to Cook.” I don’t think it’s a good idea to start kids on cookbooks that are too simplistic. Who wants to make mac and cheese or tuna casserole? Start ‘em with recipes that will knock their socks off and they’ll be hooked for life. Oh no you don’t. You don’t get to say “Salmon and chive cheesecake” and just walk away. Spill it!! Dear Pennie: I wouldn’t dream of depriving you of this treat. Although it is meant to be served at room temperature in small wedges or with crackers for spreading, I know people who eat it straight from the oven, with spoons. mixer bowl. Add onion-pepper mixture, chives, Tabasco and Worcestershire sauce. Beat to combine. Add salmon and beat just until incorporated. Lightly oil the bottom and sides of an 8-inch springform pan. Pour batter into pan. Bake in a preheated, 350-degree oven for 45 minutes, or until the cheesecake is firm along with sides but still slightly wiggly in the middle. Remove from oven and cool. with a fork as an appetizer, or surround the cheesecake with cracker and serve as a spread.